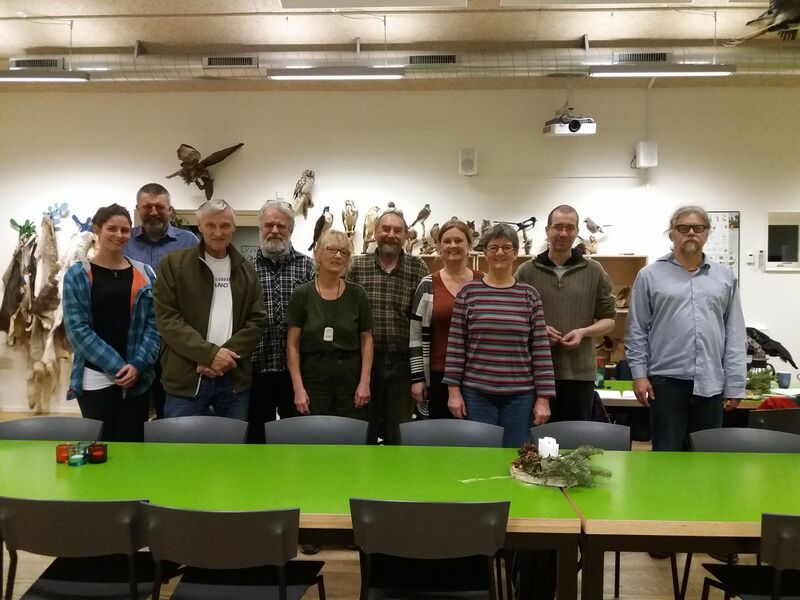 Torsdag d. 14. december 2017 blev foreningen Permakultur Randers oprettet på en stiftende generalforsamling i Randers Naturcenter. Foreningen vil arbejde for udbredelse af permakultur i Randers-området. Hvis du ønsker at blive medlem, skal du sende en email med navn og adresse til undertegnede, som er foreningens kasserer - altså til agger @ modspil . dk. Kontingentet er 50 kroner pr. år. On August 12, 2017 from 14:00 to 22:00 there will be a technoshamanism meeting in Dome of Visions, Aarhus, Denmark. The purpose of the meeting is to unite people who are interested in the combination of DIY technologies such as free software and permaculture with ancestral, ancestorfuturist and shamanistic practices. We are calling all the cyborgs, witches, heretics, technoshamans, programmers, hackers, artists, alchemists, thinkers and everyone who might be curious to join us and explore the possiblities of combining ancestorfuturism, perspectivism, new and old indigenism in the middle of the climate changes of the anthropocene. If you feel attracted by the combination of these terms, techno + shamanism and ancestrality + futurism and if you're worried about the destruction of the Earth and the hegemony of capital and neoliberal ontologies, this event is for you. In view of Aarhus' slogan as European Cultural Capital of 2017, the theme of this event could be: Rethink ancestrality and technology! We welcome all proposals for rituals, musical and artistic performances, talks, discussions and technological workshops. Please send your proposal to xamanismotecnologico@gmail.com. The proposal needs to be short (250 words) with your web site (if any) and a short bio. The verbal talks will be structured as roundtable discussions with several participants which are recorded and simultaneously live streamed as Internet radio. TECHNOSHAMANISM - What is it? 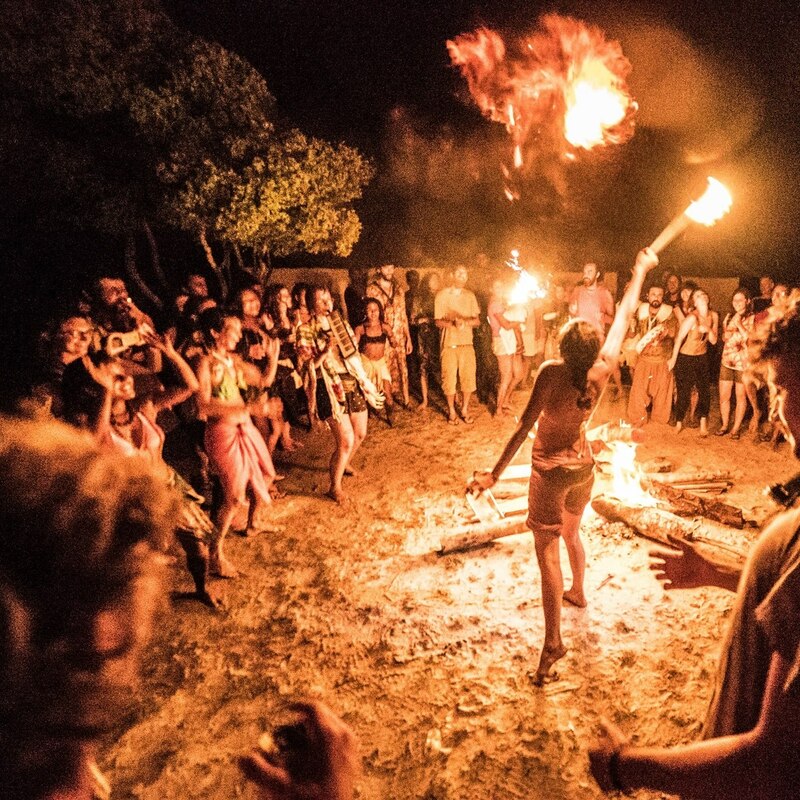 A collaborative DIY ritual to end the event - bring costumes, proposals, visual effects, ideas and musical instruments. We welcome proposals for all kinds of performance, rituals and narratives along the lines of this open call - all proposals to be sent to xamanismotecnologico@gmail.com. When we have received your proposals, we will organize them and publish a detailed program around August 1, for the discussions and workshops as well as for the rituals. If you don't live in Aarhus and need accomodation, that can be arranged (for free). Bring your sleeping bag! This encounter is organized by Carsten Agger, Beatriz Ricci, Fabiane M. Borges and Ouafa Rian. Tecnoshamanism is an international network for people interested in living out their ideas in everyday life while focusing on open science, open technology, free and DIY cosmological visions and feel the necessity of maintaining a strong connection to the Earth as a living, ecological organism. In recent years, we have had meetings in Spain, England, Denmark, Ecuador, Colombia, Brazil, Germany, and Switzerland. 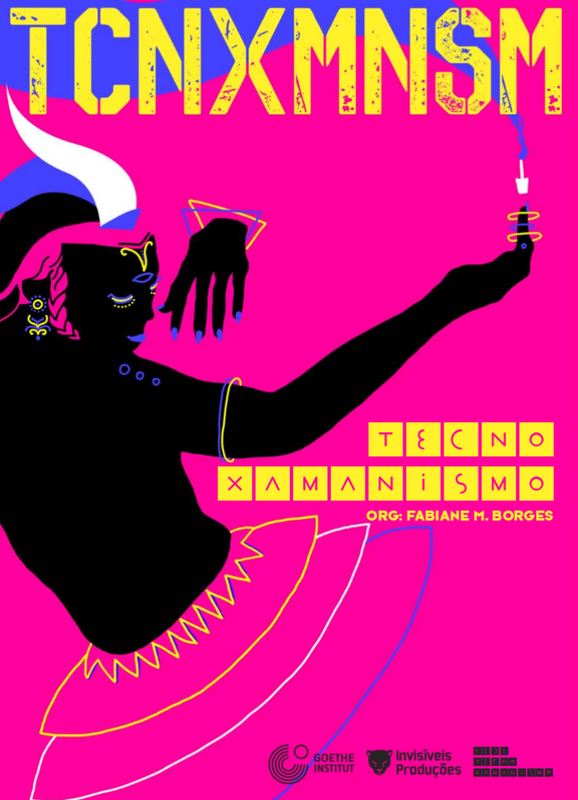 In November 2016, we had the II International Festival of Tecnoxamanism in the indigenous Pataxó village of Pará in Bahia, Brazil. The purpoose of this meeting is to discuss technoshamanism as outlined above and to strengthen and grow this network, hopefully reaching out to new partners in Denmark and beyond. The network is based in Brazil but draws inspiration from all over the world. This event is supported by Digital Living Research Commons, Aarhus University and NANO/PPGAV/EBA/UFRJ (Federal University of Rio de Janeiro). In a state of permanent warfare and fierce disputes over visions of the future, technoshamanism emerges as a resistance and as an endeavour to influence contemporary thinking, technological production, scientific questions, and everyday practices. This is how the Brazilian Ph.D. in clinical psychology, researcher and essayist Fabiane M. Borges presents this international network of collaboration which unites academics, activists, indigenous people and many more people who are interested in a search for ideas and practices which go beyond the instrumental logic of capital. In this interview with Em Rede, she elaborates her reflections on technoshamanism as platform for producing knowledge and indicates some of the experiences that were made in this context. – At first, technology and shamanism seem like contradictory notions or at least difficult to combine. The first refers to the instrumental rationalism that underlies an unstoppable developmentalist project. The second makes you think of indigenous worldviews, healing rituals and altered states of consciousness. What is the result of this combination? The combination of these two fields of knowledge historically obstructed by the Church and later by science, especially in the transition from the Middle Ages to the Renaissance. 1) When we perceive shamanism not as tribal religions or as the beliefs of archaic people (as is still very common) but as a technology of knowledge production, we radically change the perception of its meaning. The studies of e.g. ayahuasca shows that intensified states of consciousness produces a kind of experience which reshapes the state of the body, broadening the spectrum of sensation, affection, and perception. These “plants of power” are probably that which brings us closest to the “magical thinking” of native communities and consequently to the shamanic consciousness e– that is, to that alternative ontology, as Eduardo Viveiros de Castro alerts us when he refers to the Amerindian ontology in his book Cannibal Metaphysics3, or Davi Kopenawa with his shamanic education with yakoana, as described in The Falling Sky4. It is obviously not only through plants of power that we can access this ontology, but they are a portal which draws us singularly near this way of seeing the world, life itself. Here, we should consider the hypotheses of Jeremy Narby in his The Cosmic Serpent: DNA and origins of knowledge where he explains that the indigenous knowledge of herbs, roots and medicine arises partly from dreams and from the effects of entheogens. When I say that shamanism is a technology of knowledge production, it is because it has its own methods for constructing narratives, mythologies, medicine and healing as well as for collecting data and creating artifacts and modes of existence, among other things. So this is neither ancient history nor obsolete – it lives on, pervading our technological and mass media controlled societies and becoming gradually more appreciated, especially since the 1960s where ecological movements, contact with traditional communities and ways of life as well as with psychoactive substances all became popular, sometimes because of the struggles of these communities and sometimes because of an increased interest in mainstream society. A question arose: If we were to recuperate these wasted ontologies with the help of these surviving communities and of our own ruins of narratives and experiences, would we not be broadening the spectrum of technology itself to other issues and questions? 2) The shamanism of technology. It is said that such theories as parallel universes, string theory and quantum physics, among others, bring us closer to the shamanic ontology than to the theological/capitalist ontology which guides current technological production. But although this current technology is geared towards war, pervasive control and towards over-exploitation of human, terrestrial and extra-terrestrial resources, we still possess a speculative, curious and procedural technology which seeks to construct hypotheses and open interpretations which are not necessarily committed to the logic of capital (this is the meaning of the free software, DIY and open source movements in the late 20th and early 21st century). We are very interested in this speculative technology, since in some ways it represents a link to the lost ancestral knowledge. This leads us directly to point 3) which is the conjunction of technology with shamanism. And here I am thinking of an archeology or anarcheology, since in the search for a historical connection between the two, many things may also be freely invented (hyperstition). As I have explained in other texts, such as the Seminal Thoughts for a Possible Technoshamanism or Ancestrofuturism – Free Cosmogony – Rituals DIY, there was a Catholic theological effort against these ancestral knowledges, a historical inhibition that became more evident during the transition from the Middle Ages to the Renaissance with its inquisitions, bonfires, prisons, torture and demands for retraction. The technology which was originally a part of popular tradition and needs passed through a purification, a monotheist Christian refinement, and adhered to these precepts in order to survive. In his book La comunidad de los espectros5, Fabián Ludueña Romandini discusses this link between science and Catholicism, culminating in a science that was structurally oriented towards becoming God, hence its tendency to omnipresence, omnipotence and omniscience. Its link to capital is widely discussed by Silvia Federici in her book Caliban and the Witch6, who states that the massacre against witches, healers, sorcerers, heretics and all who did not conform to the precepts of the church was performed in order to clear the way for the introduction of industrial society and capitalism. So two things must be taken into account here: first, that there has been a violent decimation of ancestral knowledge throughout Europe and its colonial extensions and secondly, that the relationship between science/technology and the wasted ontologies was sundered in favor of a Christian theological metaphysics. Faced with this, techno + shamanism is an articulation which tries to consider this historical trauma, these lost yet not annihilated leftovers, and to recover (and reinvent) points of connection between technology and wasted ontologies, which in our case we call shamanism since it represents something preceding the construction of the monotheisms and because it is more connected to the processes of planet Earth, at least according to the readings that interest us. But there are several other networks and groups that use similar terms and allow other readings such as techno + magic, cyber + spirituality, techno + animism and gnoise (gnosis + noise), among others, all talking about more or less the same issues. The result of this mixture is improbable. It functions as a resistance, an awakening, an attempt to influence contemporary thinking, technological practices, scientific questions as well as everyday practices. These are tension vectors that drive a change in the modes of existence and of relation to the Earth and the Cosmos, applied to the point where people are currently, causing them to associate with other communities with similar aspirations or desiring to expand their knowledge. These changes are gradually taking shape, whether with clay or silicium technology. But the thing is crazy, the process is slow and the enemy is enormous. Given the current level of political contention that we are currently experiencing in Brazil, associations and partnerships with traditional communities, be they indigenous, afro-Brazilian, Roma, aboriginal or activist settlements (the MST7 and its mystique), seems to make perfect sense. It is a political renewal mixed with ancestorfuturist worldviews. – You've pointed out that conceptually technoshamanism functions as a utopian, dystopian and entropic network of collaboration. What does this mean in practice? Fundamentally, we find ourselves in a state of constant war, a fierce dispute between different visions of the future, between social and political ontologies and between nature and technology. In this sense, technoshamanism manifests itself as yet another contemporary network which tries to analyze, position itself with respect to and intervene in this context. It is configured as a utopian network because it harbors visionary germs of liberty, autonomy, equality of gender, ethnicity, class and people and of balance between the environment and society that have hitherto characterized revolutionary movements. It is dystopian because at the same time it includes a nihilistic and depressive vision which sees no way out of capitalism, is disillusioned by neoliberalism and feels itself trapped by the project of total, global control launched by the world's owners. It sees a nebulous future without freedom, with all of nature destroyed, more competition and poverty, privation and social oppression. And it is entropic because it inhabits this paradoxical set of forces and maintains an improbable noise – its perpetual noisecracy, its state of disorganization and insecurity is continuous and is constantly recombining itself. Its improbability is its dynamism. It is within this regime of utopia, dystopia and entropy that it promotes its ideas and practices, which are sometimes convergent and sometimes divergent. In practice, this manifests itself in individual and collective projects, be they virtual or face-to-face and in the tendencies that are generated from these. Nobody is a network, people are in it from time to time according to necessities, desires, possibilities, etc. – This network's meetings take place in different countries, mainly in South America and Europe. Can you give some examples of experiences and knowledge which were transferred between these territories? 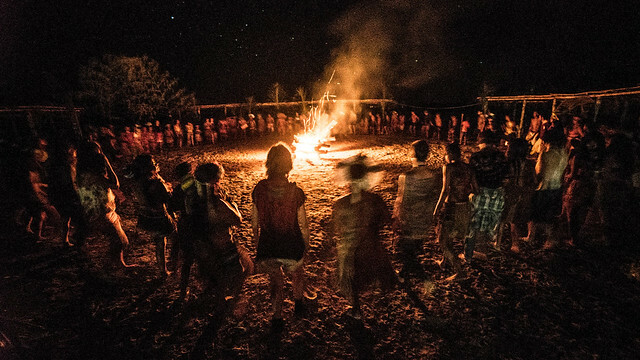 Some examples: Tech people who come from the European countries to the tecnoshamanism festivals and return doing permaculture and uniting with groups in their own countries in order to create collective rituals very close to the indigenous ones or collective mobilization for construction, inspired by the indigenous mutirão. Installation of agroforestry in a basically extractivist indigenous territory organized by foreigners or non-indigenous Brazilians working together with indigenous people. The implementation of an intranet system (peer-to-peer network) within indigenous territory (Baobáxia). Confluence of various types of healing practices in healing tents created during encounters and festivals, ranging from indigenous to oriental practices, from afro-Brazilian to electronic rituals, from Buddhist meditation to the herb bath of Brazilian healers, all of this creating generative spontaneous states where knowledge is exhanged and is subsequently transferred to different places or countries. Indigenous and non-indigenous bioconstructor's knowledge of adobe, converging in collective construction work in MST's squatted lands (this project is for the next steps). Artistic media practices, performance, live cinema, projection, music, and so on, that are passed on to groups that know nothing about this. 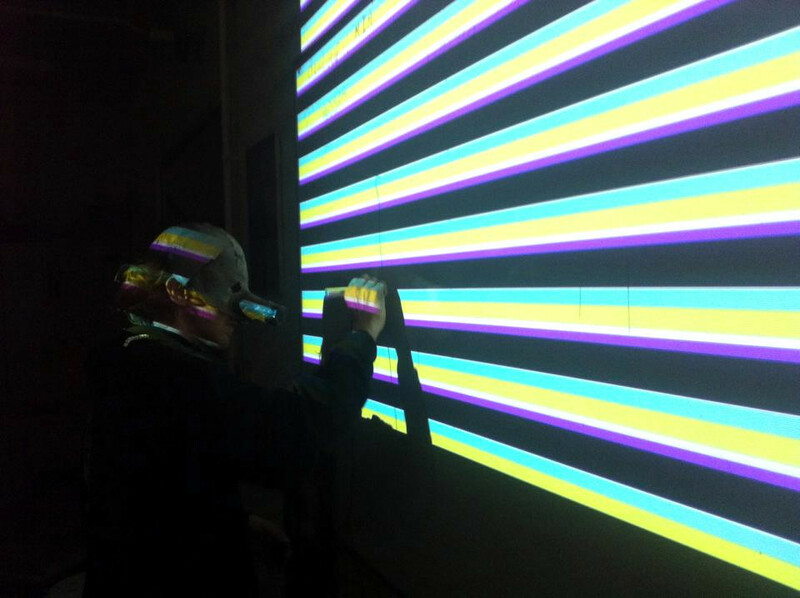 In the end, technoshamanism is an immersive and experiential platform for exchanging knowledge. All of this is very much derived from the experiences of other networks and movements such as tactical media, digital liberty, homeless movements, submediology, metareciclagem, LGBTQ, Bricolabs, and many others. In the technoshamanism book, published in 2016, there are several practices that can serve as a reference. – Technoshamanism arose from networks linked to collaborative movements such as Free Software and Do It Yourself with the same demands for freedom and autonomy in relation to science and technology. To what extent has it proposed new interventions or new kinds of production in these fields? Can you give an example? First is important to say that these movements of free software and DIY have changed. They have been mixed up with the neoliberal program, whether we're talking about corporate software or about the makers, even though both movements remain active and are still spaces of invention. In the encounters and festivals, we are going as far is possible, considers our precarious nature, lack of dedicated funding or support from economically stronger institutions, we rely mainly on the knowledge of the participants of the network, which come into action in the places. I also know of cases where the festivals inspired the formation of groups of people who returned to their cities and continued to do work related to technological issues, whether in the countryside, in computer technology, and in art as well. Technoshamanism serves to inspire and perhaps empower projects that already function, but which technoshamanism endorses and excites. I think that a fairly representative example is the agroforest, the Baobáxia system and the web radio Aratu that we implemented with the Pataxó in the Pará village. It is an exhange and simultanously a resistance that points to the question of collaboration and autonomy, remembering that all the processes of this planet are interdependent and that autonomy is really a path, an ideal which only works pragmatically and to the extent that it's possible to practice it. So we're crawling in that direction. There are networks and processes much more advanced. What we'd like to see is the Pataxó village Pará (home of the II International Festival of Technoshamanism), to take one example, with food autonomy and exuberant agroforests and wellsprings, with media and technological autonomy and very soon with autonomous energy. We'd like to see that not just for the Pataxó, but for all the groups in the network (at least). But that depends a lot on time, investment and financing, because these things may seem cheap, but they aren't. We should remember that corporations, entrepeneurs and land-owners are concentrating their forces on these indigenous villages and encouraging projects that go totally against all of this, that is, applying pressure in order to take their land, incorporate them in the corporate productive system and turn them into low-paid workers, etc. In May 2017 we met with the Terra Vista Settlement in Arataca (Bahia, Brazil). 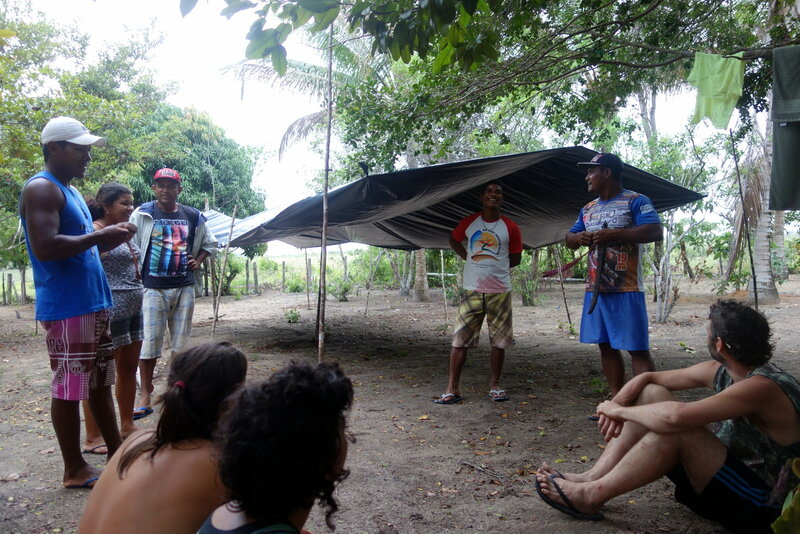 They invited the leaders of the Pataxó village to become part of the Web of Peoples8 which has this exact project of technological and alimentary autonomy and I see this as a kind of continuation of the proposals which were generated in community meetings in the Pará village during the preparations for the II International Festival of Technoshamanism. Everything depends on an insistent and frequent change in the more structural strata of desire. And when we understand that TV channels like the Globo network reach all these territories, we see the necessity of opening other channels of information and education. – Do you believe that insurgent knowledge and anti-hegemonic epistemologies should gradually take up more space in the universities or is it better for them to remain in the margin? In a conversation with Joelson, leader of the MST in the Terra Vista settlement he gave the following hint, which was decisive for me: “Technoshamanism is neither the beginning nor the end, it is a medium.” His suggestion is that as a medium, technoshamanism possesses a space of articulation, which rather than answering questions of genesis and purpose functions as a space of interlocution, for making connections, uniting focal points, leveraging movements, expanding concepts and practices concerning itself and other movements – that is, it plays in the middle of the field and facilitates processes. As yet another network in the “middle”, it negotiates sometimes within institutions and sometimes outside them, sometimes inside academia and sometimes outside it. Since it consists of people from the most diverse areas, it manifests itself in the day to day life of its members. Some work in academia, some in healing, others in a pizzaria. That is, the network is everywhere where its participants are. I particularly like it when we do the festivals autonomously, deciding what to do and how to do it with the people who invite us and we don't have to do favours or do anything in return for the institutions. But this is not to say that it will always be like that. In fact, the expenses of those who organize the meetings are large and unsustainable. Sometimes the network will be more independent, sometimes more dependent. What it can't do is stagnate because of the lack of possibilities. Crowdfunding has been an interesting way out, but it's not enough. It's necessary sometimes to form partnerships with organizations such as universities so the thing can continue moving in a more consistent and prolonged form, because it's difficult to rely on people's good will alone – projects stagnate because they lack the ressources. 4 Davi Kopenawa and Bruce Albert, The Falling Sky, Belknap Press (2013). 5 Fabián Ludueña, La comunidad de los espectros: Antropotecnia, Mino y Davila (2010). 7 MST, the “landless worker's movement” is a social movement in Brazil that fights for workers' access to land through demands for land reform and direct actions such as establishing settlements on occupied land. Festivalen foregik i Bahia i november 2016. A scene from a short film created as part of the festival's video workshop. On November 9 2016, I and my son Johannes left Denmark for Brazil in order to co-organize and attend the II International Festival of Technoshamanism. You can read more about the background for this festival at the technoshamanism site as well as in previous posts on this blog. Each participant in the festival was expected to propose an activity, and as one of the organizers I was no exception. 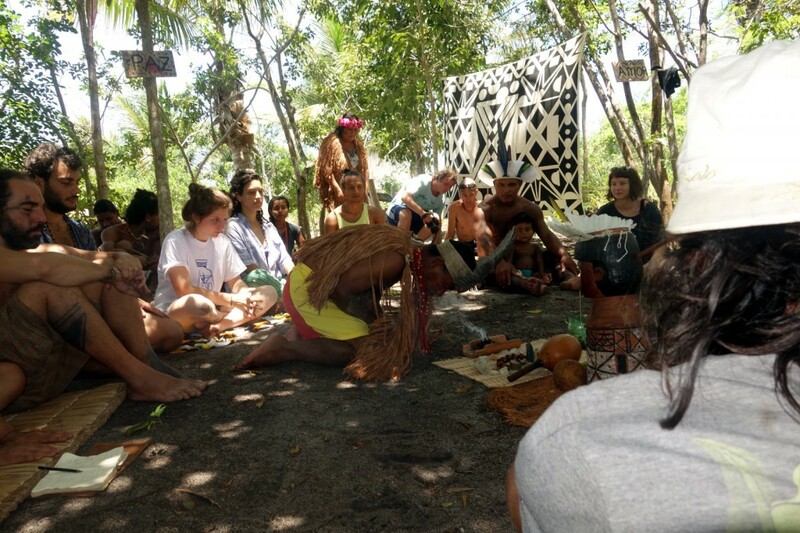 The II International Festival of Technoshamanism took place in the Pataxó village Pará in the extreme south of the Brazilian state of Bahia, and my proposal was to install a working node (mucúa) of the Baobáxia system in the village. 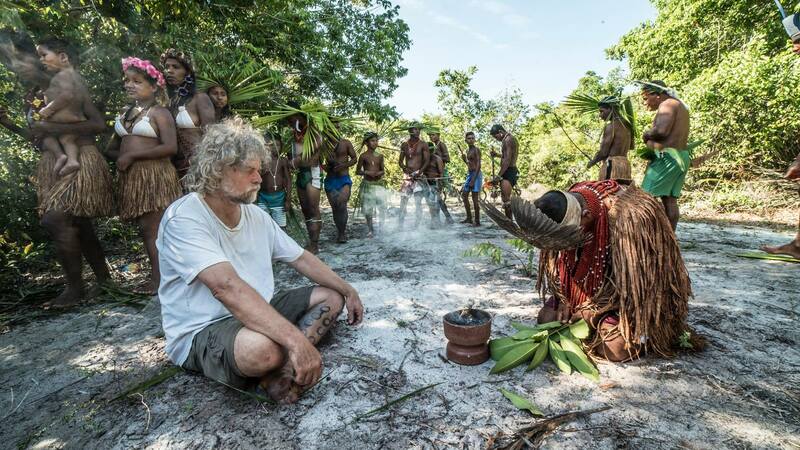 The purpose of this node is to act as an archive of the indigenous cultural production, a way yo protect and salvage the indigenous culture in electronic form for decades to come, and a way for the Pataxó to do so with complete ownership over the infrastructure as well as the content – independently of corporate and proprietary content-sharing sites such as Facebook and YouTube. Well, I’ve written about them before, after I participated in the first technoshamanism festival in 2014. 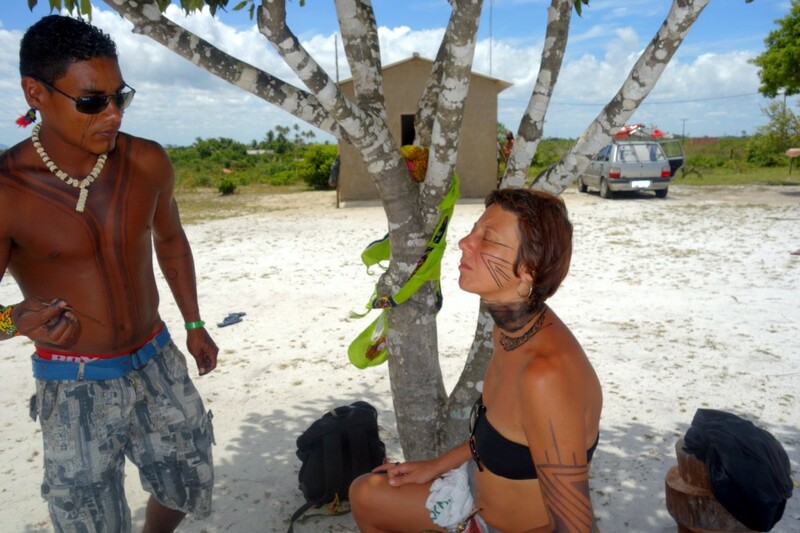 The Pataxó are an indigenous people (what we sometimes call “Indians”, indeed they sometimes call themselves that) who live near the sea in the extreme south of the Brazilian state of Bahia. The Aldeia Pará (Pará Village) is located in what the Pataxó call their origin or Aldeia Mãe, the area from which they were all expelled in the massacre of 1951. It is situated far from everything in the middle of an indigenous reserve comprising some 8500 hectares and is home to some 69 families. 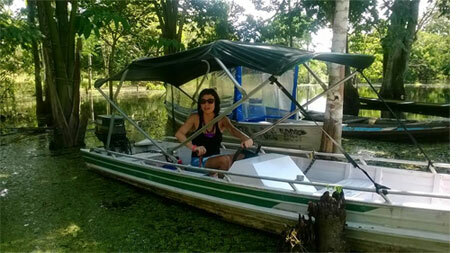 The neighboring village of Barra Velha is located 5 km from Pará and has a population of about 400 families. The Pataxó are an intelligent and open-minded people, and though they have not had much exposure to computers, they are very conscious of the potential of modern technology in the struggle for their culture and their land, which has been a constant factor in Pataxó life for several decades – not least given that many of their villages are threatened by expulsion. 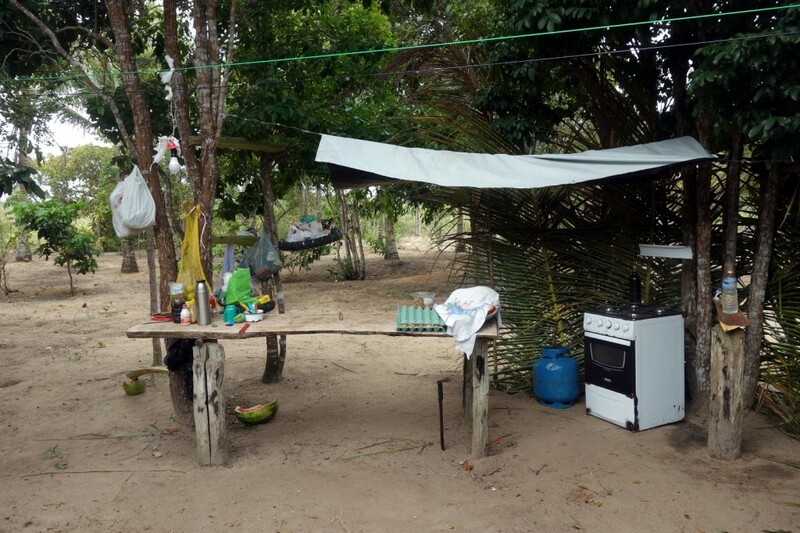 In October 2016, the village of Aratikum some 100 kilometers north of Pará was actually razed to the ground by the police in the service of local land owners. Opening ritual in Akurinã Pataxó's healing space. 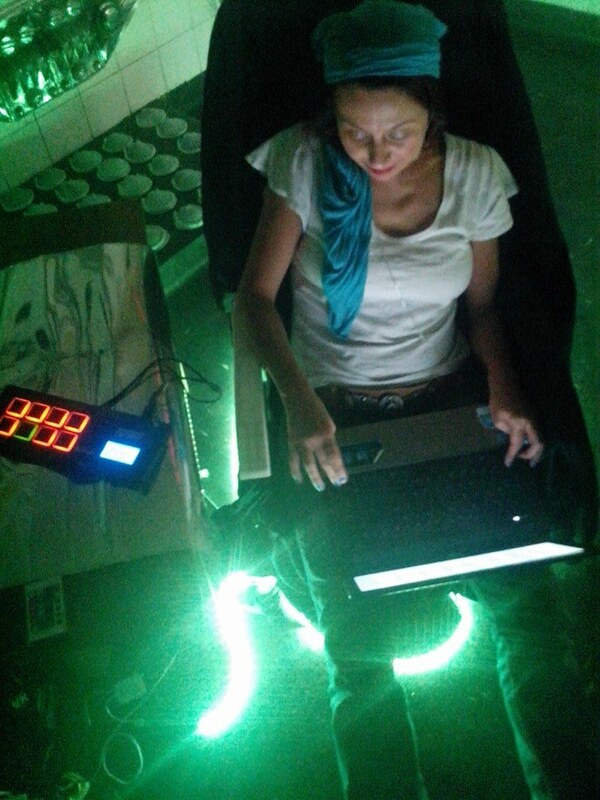 The Pataxó’s motivation for hosting the event was to be able to exchange knowledge – to learn something from all us urban hackers and activists with our experience in free software and art and social movements, and to teach us something in the bargain. Each participant would propose an activity – a workshop, an art installation, a ritual, a performance, a talk – and would be free to participate in the other proposed activities. Among the activities proposed by the Pataxó were the festival’s opening and closing rituals, a healing tent, traditional Pataxó cooking, traditional body paint, fishing and hunting methods, the cultivation of manioc and manufacturing of manioc flour, musical sessions and the jogos indigenas, the indigenous sports games which took the form of a competition between Indians and non-Indians. As I said, my proposal was to install a node of Baobáxia and – just as, or even more, important – give workshops in how to use and maintain the system (running on a dedicated Debian GNU/Linux server) themselves so it could be useful also after we left. But if the Pataxó’s motivation for hosting the event was to make friends and allies and gain new knowledge, then what was our motivation for organizing it? And by “we” I mean a large group of people in the technoshamanism network, mainly but (obviously enough) not exclusively Brazilian: Fabi Borges, Jonatan Sola, Sue Nhamandu, Rafael Frazão, Fernando Gregório, Luiza Só, Rodrigo Krul and too many more to mention, apart from the many participants who arrived at the festival with similar motives and gave many outstanding contributions? 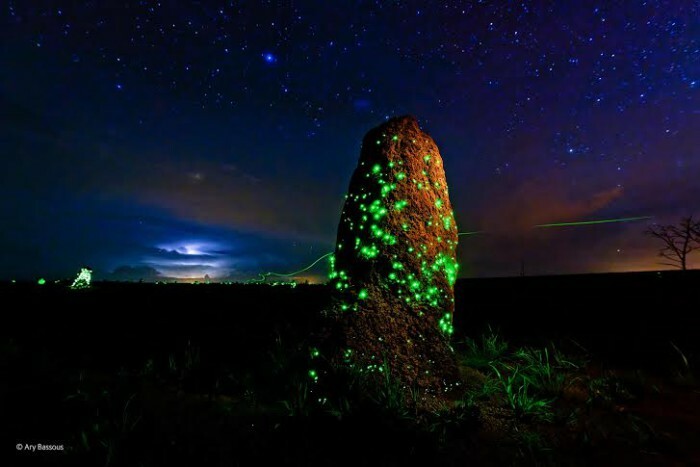 One thing is the connection of technoshamanism with reconnection - reconnecting with the Earth, reconnecting with the ancestral worldviews of the thousands of generations of people who lived close to the Earth in a mainly oral culture. The Pataxó live in a reserve where they can live well off the earth, they have a strong connection to their ancestral way of life as well as, quite literally, to their ancestors and other ancestral spirits, who often show up at their rituals. As such, the Pataxó have 500 years of experience in dealing with European colonizers and the usurping civilization, and they have developed an immense skill in navigating this kind of pressure without losing neither their independence nor their traditional culture. As opposed to that, the norm in our cities is that of disintegration, not least of community spirit and ancestral culture. Traditional songs and tales which might have been handed down in subtly changing ways for hundreds or thousands of years are replaced with comic books and cinema, which are replaced with endless children’s TV shows, which as we grow up are replaced with “breaking news”, X Factor and a host of even more diluted and inane TV shows. Culture ceases to be something we do ourselves and do together, neighborhoods cease to be communities and the cultural divide even splits up the families, so that we end up as disjoint individuals in a sea of strangers who can only struggle to recreate something vaguely resembling a genuine community. Sometimes, of course, as in the case of many successful free software projects, genuinely succeeding. In his recent novel “Jerusalem“, the writer and comic book author Alan Moore metaphorically describes this phenomenon, which he has experienced first hand in his home town of Northampton, as “the Destructor”. The Destructor was a garbage incinerator which for decades was actually and physically located in the poorest neighborhood in Northampton, reducing people’s life expectancy with at least ten years, its location a daily reminder to the inhabitants of the Boroughs of how little the rest of the city cared about them. The Northampton neighborhood known as the Boroughs descended into complete misery and insecurity, containing the points of trade that “supplied the customers who drew the girls, who brought the pimps, who dealt the drugs, which bred the guns that shot the kids who lived in the house that crack built” (p. 691). But there’s a point in that – that kind of misery is very common in urbanized Brazil as well as in Europe, and a contact with people who still retain an orally transmitted culture and whose communities were never fragmented by the Destructor could teach us something about reconnecting, with the Earth and its spirits, with our natural spirituality and with true community. 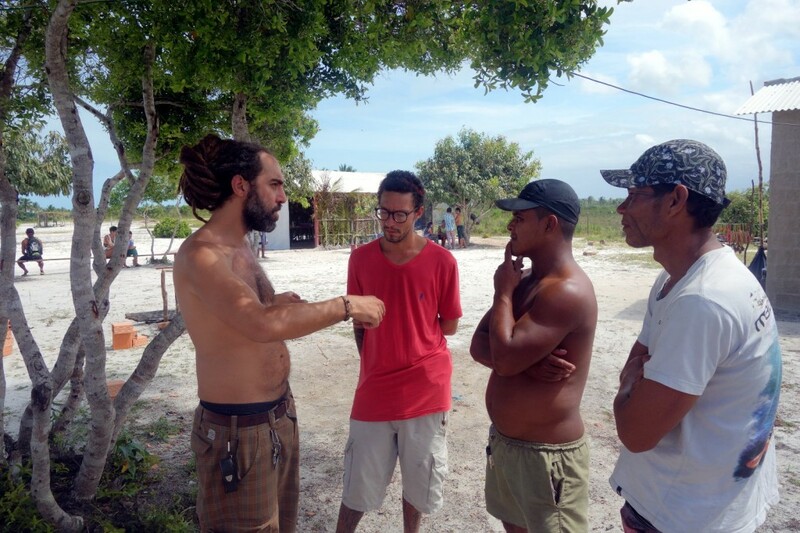 As we arrived in Pará about November 14, our first job was to establish a good contact with the Pataxó, organize food for the event and start rigging the computers and other technical equipment. As everybody else, we were camping in what was at first quite precarious conditions due to the heavy rainfall before the festival started. Luckily, the Pataxó were very helpful and we managed to secure everything against the rain before the start of the festival on November 22. Before our arrival, the Pataxó had built a completely new house for cultural production, in which they had placed four stationary computers they had received from the reservation’s Fisherman’s Association which originally got them from a government program. These four computers were quite old and had Windows installed. Our first task was to replace that with GNU/Linux. At first, our attempts at setting up the computers were haunted by technical difficulties. First of all, we were unable to get them to boot from USB drives, which meant we had to buy burnable CDs or DVDs. When we got them, we realized they could not really boot from the DVDs either due to our images being 64 bit, and these trusty old computers were actually 32 bit. We couldn’t use the Internet for troubleshooting since there was no Internet yet – it was supposed to arrive during the week before the festival, but the roads were closed because of the rain. In the end, Pablo Vieira from the Assentamento Terravista near Ilhéus (with the microphone in the picture above) arrived, and as it turned out, he knows these computers very well; they can boot from USB if a rather obscure BIOS setting is enabled. In his pocket was a bootable USB with the most recent 32 bit Linux Mint, and everyone was happy and the computers were well prepared for the arrival of the Internet later that week. The Internet arriving at Aldeia Pará. Pataxó warrior Txayhuã is painting festival organizer Fabi Borges while the operator's car has stopped at the new culture house. Half an hour later, there was Internet. I was not alone in the task of installing Baobáxia and giving workshops about it – Vincenzo Tozzi from the Mocambos network, Sicilian and founder of the Baobáxia project, joined the festival as well. Vince is a programmer and computer scientist and wrote a major part of the Baobáxia system himself, but he is really a philosopher of networks with important insights in the potential of free software and offline digital communications, and his presence was an invaluable contribution to the festival. Vincenzo Tozzi from the Mocambos networks explains Baobáxia to village chief Ubiratã. Also listening are Pablo Vieira and Arapaty Pataxó. Our two workshops in Baobáxia were a huge success, and especially the younger generation of the Pataxó showed a great interest in working with this technology. The Baobáxia node we installed is still active in the village and is still not connected to the Internet, but you can see the contents in its present degree of synchronization here. What else was in the festival? And video workshops, radio workshops, capoeira, samba in the church in honor of Saint Benedito, seed exchange, agroforestry, construction of dry composting toilets, radio production, discussions about the pros and cons of ecoturism, and much, much more. I might do a followup post on that, in the meantime let it be said that the festival was a unique experience and I’m very happy to be one of the people who made it happen. Artiklen er også at finde på teknoshamanisme-bloggen. Bogen TCNXMNSM, som vi udsendte en "call for papers" til for to år siden, er netop udkommet med bidrag af bl.a. undertegnede - og 54 andre bidragydere fra mange forskellige lande. Bogen er produceret med støtte fra Goethe-instituttet i São Paulo. Den er udkommet på brasiliansk portugisisk, og alle bidrag, som er modtaget på engelsk eller spansk, er oversat til dette sprog. Læser du ikke portugisisk, vil jeg opfordre dig til alligevel at kaste et blik på bogens meget flotte og interessante billedside. Klik her for at downloade bogen i PDF-format. Psykiater Joanna Moncrieff forklarer, hvorfor forestillingen om psykisk sygdom som en "kemisk ubalance" i hjernen, som psykofarmaka korrigerer for, er en myte. Psykofarmaka korrigerer ikke en kemisk ubalance, de skaber den. DIY ritual, DIY cosmogonies for the anthropocene. The inspiration for the ritual are the pollution disaster in the Rio Doce in Mariana (Brazil) and the nuclear disaster in Fukushima. The ritual's theme is disaster, devastation, destruction. During the days 19 and 20 of February/2016 there will be a technoshamanism meeting in Berlin! This meeting intends to gather people that are interested in the intersection between DIY technologies and ancestor futuristic knowledge. By „ancestor futuristic knowledge“ we understand the approximation of ancestral knowledge, cosmovisions, alquimy, shamanisms, magic, free cosmogonies with foresight technologies and possible futurologies. If rationalism and individualism somehow exhaust a way to produce an ecologically and socially balanced existence, and if the Earth presents emergencies that the anthropocentrism can’t take care of, what can we do to reach other relations of states between human / nature / cosmos? All this discussion about interspecifcs, subjectivity of matter, anthropocene, and theoretical speculative discussions is something that moves us / touches, or is it just the latest intellectual agenda in international meetings, which soon will sound as obsolete concepts? You can approach if you feel called by the junction of these terms (techno + shamanism, ancestrality + futurism). You can come to the workshops, discussions and rituals that will be made during the whole weekend in free radio format, with free expression and listening space for many different backgrounds.